TORONTO - Frustrated coffee drinkers who have "hacked" their way around pod roadblocks built into the new Keurig brewers may just be looking for a hurdle to overcome, says the president of Keurig Canada Inc.
"There are some, when you give them a challenge, they'll really get at it," Stephane Glorieux said in an interview Monday. "Whatever you throw at them, they'll find some way of doing it." Keurig is facing criticism over the latest version of its popular coffee machine, the Keurig 2.0, which uses technology that restricts the machine to brewing K-Cups from its licensed partners. Other pods are rejected by the machine, leaving some coffee drinkers with a stock of unofficial K-Cups they can't use, even though they worked in older models. Their frustrations have sparked a backlash from some customers and competitors in the coffee industry. The technology changes to machine have been largely unadvertised by Keurig, which launched a major campaign this fall to promote the new model. Reviews on various online retailers widely pan the Keurig 2.0, calling for a boycott of the technology, while numerous videos appeared on YouTube explaining how to circumvent the technology through either installing a magnet into a part of the machine or making modifications to its hardware. "You can't stop creativity," Glorieux said. "We are absolutely aware of these inefficient ways and we certainly don't recommend them." However, Keurig may have a bigger challenge on their hands after some of its competitors filed a complaint with the Competition Bureau last week alleging the company is using anti-competitive measures to keep unlicensed products from being used in the latest version of its popular coffee machine. The complaint comes after Ontario-based Club Coffee filed a $600-million lawsuit last month alleging Keurig has attempted to reduce competition. Coffee pods have grown into a booming business for Keurig's K-Cup and others, like the Nespresso machine, which appeal to coffee fans searching for a faster and more convenient way to brew a cup. The K-Cup market opened to competitors when Keurig's patent on the pod design expired in 2012. Other companies launched their own pods compatible with the popular machine, putting a crimp on the growth trajectory of Keurig. However, Glorieux said the new machine has numerous new patents built into it that protects its latest technology. "We're a disruptive innovator, and we push the envelope," he said. "Disruptive technology pushes you to create new patents." "We have 460 engineers that are actively looking at the future, so the patent is a way of life for us," he added. 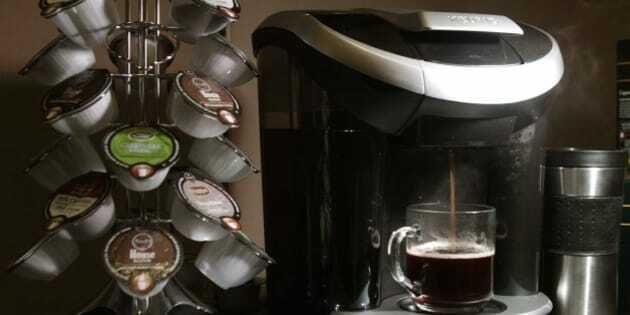 Broader implications could develop from Keurig's fight to maintain control of its machines, some industry players have suggested. If Keurig maintains a stronghold on the coffee market, it'll give the company greater control over already soaring coffee prices, and fewer competitors that could offer a cheaper product.